A Nigerian woman, Shalom Sam-Ogbaji and her three kids have been declared missing in Lagos. According to Lawrence Olanrewaju, who shared the story online, Shalom and the kids were last seen on Friday January 25th at Ajao estate. Since then, no word has been heard from them. 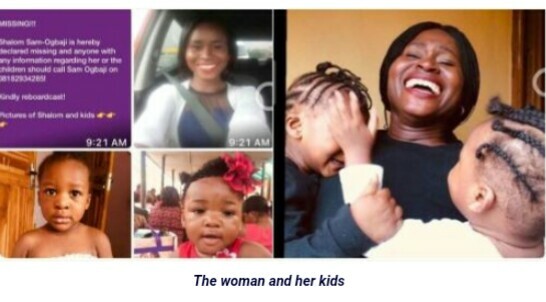 He wrote; 'My big brother's wife - Shalom and their kids were last seen on Friday 25th January, 2019 at Ajao Estate, Lagos. Any information about their whereabouts is highly appreciated! Call Sam on 08182934285. The case has been reported to the Police. Please kindly retweet."